I’m snacking on mango slices, baking a cake and writing about these whole wheat chocolate chip banana scones all at once — in other words, I’m living out the thesis of my food life. It’s a bit of a metaphor for how my brain has felt lately, too — a little all over the place, a little chaotic, a little nonsensical. This week was crazier than expected and so, apologies for leaving you hanging last Thursday (but I hope you were cool with a few extra days to ogle over this gnocchi situation). Hopefully things in my life and on this blog will be back on track. Aaaaaand now, these scones. Whole wheat chocolate chip banana scones, also known as “cookies” to the tot (her words, not mine), which I’m OK with because these are some of the healthiest “cookies” she’ll ever enjoy for breakfast. These scones have been quickly disappearing, generally in the morning hours, after the pitter-patter of feet make their way into the kitchen — the husband’s to the coffeemaker, mine to the toaster and the tot’s to the container on the counter that currently houses the “cookies.” She knows one is about to make its way from the container to her melamine Minions-themed plate, and so she waits — sometimes patiently, quietly sipping on her milk, other times not so patiently, with chubby fingers reaching just over the counter’s lip in undeterred determination to snag one of those scones before Mom does it for her. Thankfully they are just far enough out of her reach that we haven’t had a disastrous avalanche of the banana scone variety (that’s not to say it hasn’t happened with other foods stored on the edges of our counters). Soon, we all settle in with our breakfasts — the husband with a banana scone and a heap of cheesy eggs, me with a slice of peanut butter toast and a more modest heap of eggs, and the tot with compartments of eggs, clementines, blueberries and that beloved “cookie” covering the faces of Kevin, Stuart and Bob. She picks out and eats each chocolate chip first, naturally, and then proceeds to munch away at the rest. It’s crumbly but softer than most scones, thanks to the banana and brown sugar. The flavor is mildly sweet and cinnamon-y, the texture light and slightly chewy from the rolled oats, and the heartiness of the whole wheat flour is hardly detectable in any other way apart from its nutritious value. 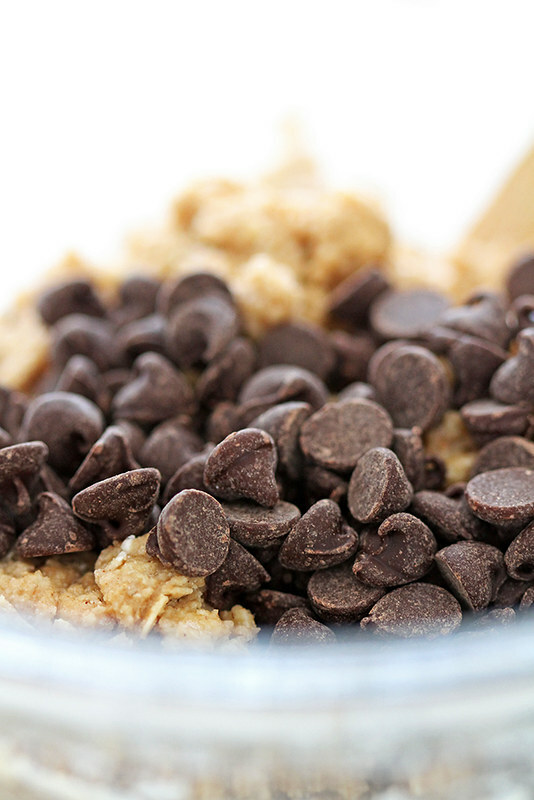 The chocolate chips offer little pockets of indulgence — as the tot has already come to discover. Suddenly, the scone has disappeared and all that’s left is a smile — one on her face because she thinks she just got dessert for breakfast, and one on my face because she just ate something homemade and wholesome and actually enjoyed it, for once. There’s also a smear of chocolate on her cheek that I can’t help but smile at, too. Whether you bake these for the little ones or big ones — or both — in your family, I hope you enjoy them as much as we have been. Heat oven to 425 degrees F. Line baking sheet with parchment paper; sprinkle lightly with flour. Bake 12 to 15 minutes until scones are baked through and toothpick inserted in center comes out clean. Cool slightly before serving. *NOTE: If the dough seems too warm or soft at this point, you can transfer it to the fridge to chill for about 10 minutes before proceeding with the recipe. 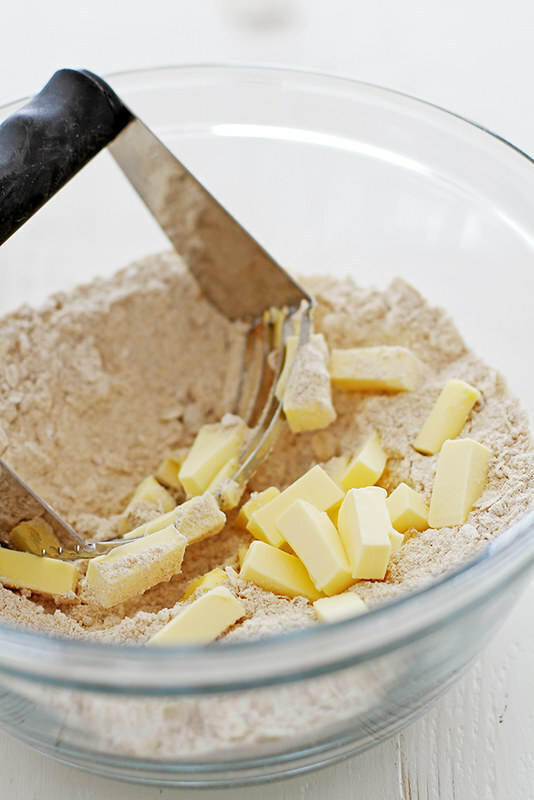 The key is to keep the butter as cold as possible at all times, so this might be necessary after handling the dough. These sound delicious, I’ve never thought to put banana in scones before but it must help to keep them lovely and soft as well as tasting good (especially with the chocolate!). Such a delicious way to begin the day! Yum! These sound delicious. I love whole wheat. Ooh I love eating and making a good scone–especially if they are secretly healthy 🙂 looks delicious! These scones sound incredible! I absolutely love banana flavored baked goods!! These look delicious! I know Casper would love these because anything with a little bit of chocolate is his favorite. He also has that minion plate and loves it, too. Hello breakfast perfection! 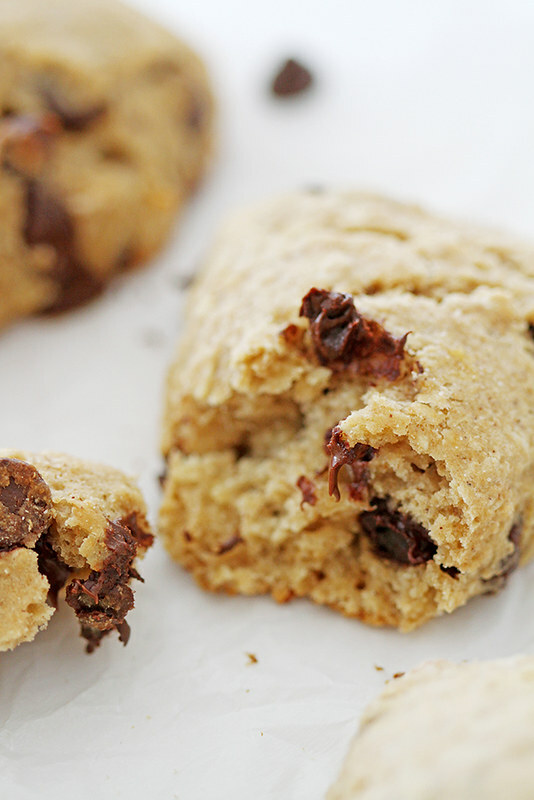 Love these scones and all the chocolate chips, of course! I love scones, but I would’ve never thought to add banana! Yum! yum! I’ve been looking for a good whole wheat scone recipe. Those two things just usually don’t go together… oh, but I so want them to! My tummy wants a scone, but my waistline wants whole wheat. These look divine. thank you for sharing! Hope this week goes a lot smoother for you! I just pinned these and can’t wait to make them! I love chocolate chip anything! Have a great rest of the week! Taylor — Oooooh, yes, let me know how they turn out pls! These scones are what my dreams are made up! 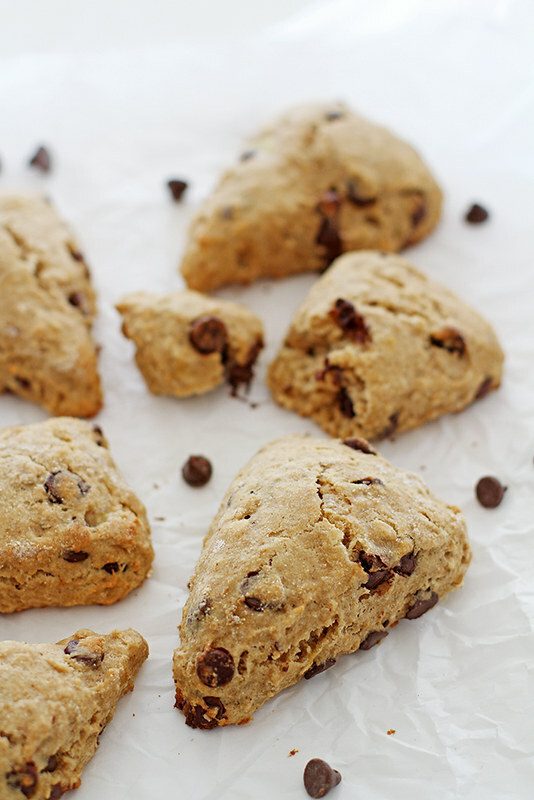 I love nothing more than bananas, chocolate and scones! 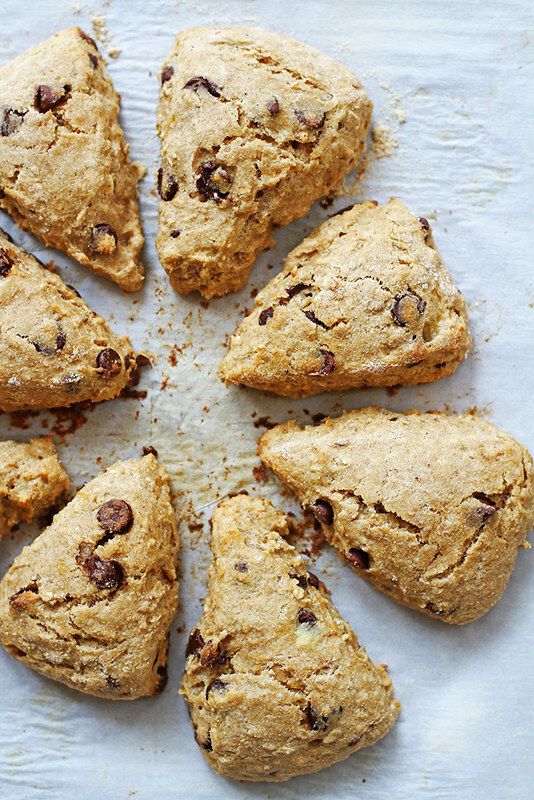 I added about 1 tsp of this chai spice blend to the recipe and it put these scones over the top! For some reason, my earlier comment that these were really wet and required an extra cup of flour (and extra tsp of baking powder) to be handle-able isn’t showing up. They had good flavor and good texture, but weren’t very scone-like to me. I think next time I’d try turning them into mini muffins or something instead. Mmmmmm these look incredible, I adore scones! Am — Sorry to hear the dough didn’t work out well for you! It is pretty wet on account of the bananas, but I had some luck with sprinkling flour on top when shaping it, and letting them chill for a few minutes after handling. Made these with whole wheat pastry flour and peanut butter chips instead of chocolate. Frozen my butter for a little while so that I could grate it into my dry ingredients (I find this works wonders with scones and biscuits). Turned out very tasty! Always on the lookout for new ideas to use my extra ripe bananas. Thanks for a quick, easy and tasty recipe to start our day off! Looks wonderful! And by the way for some reason on Google Chrome the amount of oats doesn’t display correctly and is just a box, but when I switched overt to another browser I could see it was supposed to be 1/3 cup. Just thought I’d let you know. Rosemary — Thank you for the heads up on the display error! I made these this morning and did not end up with a scone-like texture. More like a muffin shaped like a scone…. I did refrigerate the dough for a while because it was clearly too soft (not at all formable, more like muffin batter). Even after baking and letting cool, they are soft like muffins. Thoughts?? It seemed like too much moisture for the amount of flour?? Regardless of the shape though, they were DELICIOUS and the kids were thrilled to have CHOCOLATE CHIPS with breakfast! What a treat! I just made them and don’t want to stop eating them! Can’t write anymore since I’m going to go split one in half and toast it and smear it with peanut butter and jam!!!! !